A STUDENT athlete in East Lansing, Michigan wakes up in their college dorm room and heads out to greet the day where they’re immediately hit by their surroundings. The 75,000 seater Spartan Stadium, home to the Michigan State University football team, towers above the horizon. A stone’s thrown away is the 15,000 seater Breslin Centre, home to one of the top-ranked college basketball sides in the US. Just around the corner is the Munn Arena where ice hockey games attract 6,500 screaming fans. At Michigan State University, sport is a way of life for many of the 60,000 students who study there and in the middle of it all is Bennekerry man Bobby Crowley, currently in the first year of an athletics scholarship after a stellar juvenile career which saw him win countless Leinster and All-Ireland titles in the colours of St Laurence O’Toole’s and Knockbeg College. The 18-year-old made it home for Christmas to catch up with family and friends after a whirlwind first four months in the US. He has settled in well to the city which is an hour west of Detroit. It was helped by the fact that the entire athletics roster met up in mid-August for a training camp. Introductions were made and the outgoing young Carlow man soon found his feet. The US has long been an attraction for young Irish athletes seeking scholarships, going right back to Ronnie Delany in the 1950s, through to John Treacy, Eamonn Coghlan, Sonia O’Sullivan and many more. Renowned athletics coach Brother John Dooley has long mentored Irish athletes thinking of heading to the States and with his help, Bobby made contact with some colleges. With a schools record which includes numerous national championships and a fifth place in the 1500m at the 2016 European Youth Championships, it was no surprise that offers rolled in. In the end it came down to Michigan State, Iona in New York and Tulsa in Oklahoma. His mock oral Leaving Cert exams clashed with a planned trip to check out the schools so he took a leap of faith. “I knew the coaching would be good and it’s a big university,” Bobby says. It also helped that another Carlow man was able to give him the lay of the land. 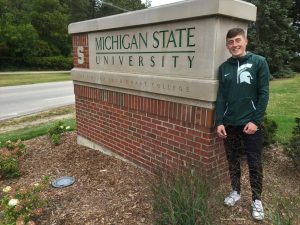 Ronan O’Brien, son of Carlow senior football manager Turlough, had spent a semester at Michigan State as part of his sports science studies at IT Carlow. The reports were positive so he decided to make East Lansing his home. Mornings are spent in class where Bobby is studying business and from 3-6pm every afternoon, the athletics team meets up to train. Academic advisors make sure training never clashes with class so he’s free to focus on the reason he’s there: to improve as an athlete. “We compete at Division 1 level so the competition is tough,” he says. “There’s no age groups any more so obviously an 18-year-old like myself coming in is not going to be as developed as a 22-23-year-old at the other end of his college career. The transition has been made easier by a system called the ‘red shirt’. In the US, athletes are eligible for student competition for four years, but you can declare as a red shirt for a season, meaning you don’t actually represent the college in competition and you can still run into a fifth year, should you choose to continue your studies. Bobby was a red shirt for the pre-Christmas cross-country season which meant the pressure was off and he could focus on settling into his surroundings. He hasn’t decided yet if he’ll do the same for the upcoming indoor and outdoor seasons which run between now and May. In the meantime he’s building up the miles and getting stronger every day. A friend of his, Barry Keane from Waterford, is a freshman athlete in Butler, Indiana, just a couple of hours up the road so they meet up from time to time to chat about their new adventures. Like how to cope with unusual questions from his new American friends. “Americans can be so individualistic,” he says. “They literally don’t know what’s out there. One guy asked me how my English was so good. He thought I spoke Gaelic as my first language. The trip home was food for the soul. He surprised his mother, Angela, who wasn’t expecting him to arrive until later in the week before Christmas. His mother and father, Kieran, are proud of how he’s getting on and make sure to get regular updates on whatsapp. He admits he misses family, the lads, the GAA and the craic. Although he did enjoy a few milestone moments before he had to head off last August. There will always be a draw from home, but far stronger is the sense that he’s enjoying his new environment. Northern Michigan freezes over for the winter but soon the thaw will set in and new goals will come onto the horizon, like representing his college in competition. He also hopes to qualify to represent Ireland at next summer’s World Junior Athletics Championships. He needs to shave a little off his personal best for the 1500m or 800m to make the cut, but he’s confident he’s moving in the right direction. “They’re in Helsinki which is a nice part of the world so I’d like to get there,” he says. Meanwhile, it’s back to Michigan. His very own corner of the world in East Lansing, chasing new challenges. Running a new path.